It is great for the skin, with it's natural lactic acid and Vitamin D. Wholesome, nutrient-rich goat's milk will help the skin maintain its natural balance, excellent for sensitive skin and gives you a glowing complexion. 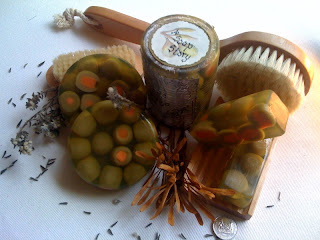 Olive soap - the olives are soap too!! Olive soaps or Castile soaps are olive oil based soap. Olive oil contains natural Vitamin E, antioxidants and help hydrates the skin. Castile soaps are 100% olive soap but I find that olive oil does impart a slimy feel to the soap and traditional castile is more a paste than a soap bar. Olive oil when mixed with other harder oils like coconut and palm oil makes an excellent soap bar. 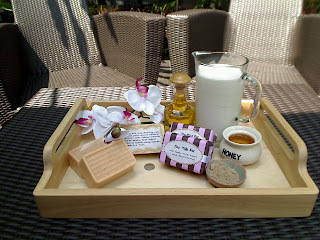 25% of organic kosher extra virgin olive oil is use to make these soaps. Ingredients: 25% organic kosher extra virgin olive oil, palm oil, coconut oil, safflower oil, glycerin (kosher), purified water, sodium hydroxide (saponification agent), sorbitol (moisturiser), sorbitan oleate (emulsifier) and soybean protein (conditioner).